You can read the latest and past editions of our digital magazine – if you’re interested in subscribing please contact us. 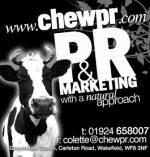 Long Business Description: Chew PR is a Wakefield based PR agency that believes it is the results that do the talking. No jargon, no fluff, no inexperienced juniors, just sound PR and marketing sense that is known to raise your reputation and build your business. Founded on PR tradition, but not fixed on past ways of working, we know an open mind and flexibility is the key. This is why our PR services are considered and matched to your priorities to provide what is best, and what works. We believe in our approach, not because of blind loyalty but because our processes are proven, we’ve worked hard to achieve them, and the return on investment for our clients averages way beyond their investment. Offering consistent and well-executed communication services we specialise within the care industry delivering public relations services that get straight to the heart of your needs. Successful businesses are founded on successful communications. You need to be seen, heard, and listened to. We take the complexity out of everything to open communication channels that develop understanding, trust, recommendations and ongoing business for you. In our multimedia world of TV, radio, press, publications, the web, and social media, getting the right message to the right people in the right way matters more now than ever. Our promise is to deliver purposeful PR campaigns that deliver just the PR you need. We bring a personal and effective approach to every project we work on, which is why our clients love us, and why they keep coming back. Speak to any one of our clients and each will tell you how easy our working relationship is, how we understand their business, how they trust us implicitly, and how they value our input in their business. Long Business Description: Hilton Nursing Partners delivering innovative solutions and passionate about what we do, our vision of a successful healthcare provider powered by the quality of its people and the strength of its principles has created a unique organisation trusted to support patients across the country. Working with the NHS and Social Care Commissioners we successfully deliver safe, timely and supportive hospital discharges, patient assessments, patient recovery programmes, Hospital Avoidance and Healthcare Coaching Services. Our unique Hilton model of nurses, therapists and nurse led personal nursing assistants has a proven track record in freeing hospital beds, as well as reducing admissions and re-admissions and ongoing social services support. The success of the Hilton Partnership model is evident to the 20,000 patients we have supported and the excellent patient, staff and commissioner feedback we receive. Long Business Description: W & P Training offers businesses a variety of services within the Adult Care Sector specifically tailored to enhance Care Quality Commission requirements. W & P are a family run business established in 2001 which prides itself on the quality of its products & services. We provide a professional, responsive, efficient and impartial service to providers in the Health & Social Care sector. Our team of industry professionals come from a range of backgrounds including: CQC Inspection, Local Authority Policy & Commissioning, Nursing, Social Care, Executive Board Members & Former business owners. Our products and services are up to date with the latest legislation and regulatory guidance and are competitively priced, easily accessible and written and presented in various formats to meet your business needs. The Care Quality Commission or CQC have asked a few selected bodies that specialise in care management to develop a Bespoke Standard, designed solely for the Care Sector. As a result the CES or ‘Care Excellence Standard’. Has been developed and is expected to be launched in the spring of 2016. Providers who attain the CES will demonstrate that their service EXCEEDS the current CQC standards and will act as a Mark of Excellence against your service. CQC are planning to introduce a new ‘ratings’ initiative which will indicate the level and standard of care provided in care homes. CQC have indicated that the implementation of CES, followed by a 3rd party, independent evaluation will assist Care Providers to achieve the highest rating and will make monitoring much simpler for the provider. W&P has applied its experience and expertise to develop a training suite that covers all 15 standards of the care certificate. Because we have all worked in Health & Social Care we understand the importance of making training easily accessible, clear and user friendly. Our pack is clearly written so that it’s manageable for the learner and the assessor. The pack includes Notes and Introduction for the provider and Observation Guidance for assessors and an electronic spy pen so the trainer can record evidence. W&P Care Certificate training suite is a comprehensive one stop shop for Care Providers and is backed by our renowned excellent customer service.